Gospel music has a long tradition in singing families and Nashville's The McCrary Sisters come from a proud heritage which stretches back to their father. The Reverend Samuel McCrary was one of the original members of the legendary quartet The Fairfield Four. Now, after years of working behind the scenes providing bvs for some of the music world's biggest stars, Ann, Regina and Deborah McCrary and Alfreda McCrary Lee are picking up rave reviews in their own right with their latest album 'Let's Go'. The Sisters' musical roots go way back to the Fairfield Four and the church they grew up in, St Mark's Baptist Church in Nashville's Germantown. Remembered Regina, "The deacons and the mothers used to do an old thing called 'Dr Watts'. It was an old hymn. It was kinda like back in the slavery days when they wanted to get messages to each other and not let the master know what they were talking about. There was this woman - she's dead now - Sister Roper. She would start out doing old 'Dr Watts' and everybody was listening. At that time, I was so young I thought it was funny, because I was like, 'What are they sayin'?' Turned out when I got older and life started dealin' what life deals to you that 'Dr Watts came [closer] to reality." Ann and Regina once sang with the BC&M Mass Choir (BC&M standing for Baptist, Catholic & Methodist) and in fact a video on YouTube shows Regina singing with the BC&M Mass Choir age nine! The Choir's "I Made A Vow" was nominated for a Grammy. From 1979 to 1985 Regina recorded and toured with folk rock superstar Bob Dylan and appeared on his three Christian albums 'Slow Train Coming', 'Saved' and 'Shot Of Love'. In 2003 Regina was featured as the lead vocalist with the Chicago Mass Choir on the CD and DVD 'Gotta Serve Somebody: The Gospel Songs Of Bob Dylan'. On the website for the project Regina wrote, "When I got with Bob Dylan, I began to study his music before, to see who this man was. And I came to a realization that this man has been feeding people wisdom and words of encouragement. And God has been using his hand and his heart and his mind to write music, to write lyrics, to keep people encouraged and keep them uplifted and keep them in the fight and keep them like soldiers, you know. Don't sit down, don't lay down. You gotta stand up, you gotta fight, you gotta believe!" At different times Regina has also shared the stage with Elvis Presley and Stevie Wonder. It wasn't to be until 2007 that Regina got to record her own solo album, 'I Made A Vow'. Ann McCrary too through the years gained plenty of experience singing bvs for The Winans, Donnie McClurkin and Yolanda Adams and also recording two solo albums, 'What Is This', produced by Cedric and Victor Caldwell; and 'Ann McCrary', produced by Steve Crawford. Ann was also a member of Bobby Jones's Nashville Super Choir for 12 years. The other two sisters didn't pursue music careers, Alfreda working with her husband Narcisco Lee at Nashville's Old Happy Day Church, and Deborah working as a nurse. 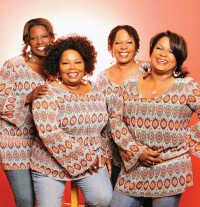 The four sisters began singing together and in 2001 were asked by Lost Highway Records to contribute their soulful harmonies to the 'Beautiful Stars' album by Isaac Freeman, the bass singer with The Fairfield Four who though in his 80s had suddenly found national interest thanks to his breathtaking vocal on the 'O Brother Where Art Thou' movie soundtrack. Said Ann, "When they wanted us to sing on Isaac Freeman's CD, that was the beginning, I think, of what you'd call the domino effect." More sessions followed for different Americana artists. Then, in 2009, the four sisters decided the time had arrived to record an album in their own right. Said Ann to the Tennessean blog, "You grow up in the same house and sometimes you argue and fuss and you think, 'I'll be so glad when I can get away from here'. But we'd come together, and it was feeling so good and normal and natural. It was the best we could have done." On its release in 2010 Blurt ezine wrote about 'Our Journey': "Gospel music which offers fresh perspectives on the Church experience, but which is almost guaranteed to appeal to those who merely seek musical enlightenment." The project took in a funky version of Dylan's "Blowin' In the Wind"; a rendition of Julie Miller's "Broken Pieces" featuring a soulful lead by Alfreda McCrary Lee and with Buddy Miller playing guitar; a duet between Regina and country music's Delbert McClinton on "Other Side Of The Blues (Since I Met You)" and country star Patty Griffin sharing the mic with Ann on her song "Know My Name". 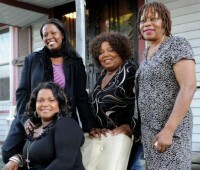 In 2013 acousticmusic.com lent an ear to the second album by The McCrary Sisters, 'All The Way'. They wrote, "This disc, like their first one, is a mixture of originals, 10 by one of the sisters sometimes with a collaborator, and the remaining two, one by the team of Gary Nicholson/Tom Hambridge/Buddy Guy, and one by Bonnie Bishop/Jimmy Wallace. There is a variety of musical styles, however whatever song the girls and producers Tommy Sims and Kevin McKendree choose, the singing and arrangements are filled with the same passion as is in these women." The Tennessean singled out the song "You Can Make It Through The Night", written by Regina, calling it "a ballad of empowerment, born in a time of loss and distress." The first verse of the song was written12 years earlier when Regina's son was killed. She remembered, "I was crying, and told a friend, 'I don't think I'm going to be able to make it.' He said, 'All you've got to do is just make it through the night.' I wrote a verse about that, and sang it over and over again, and then when we decided to do this album I came up with three more verses. You never get over something like that, but you learn how to live with it. So each time I deal with an anniversary or a birthday, where I used to just ball up in a knot and cry, now I smile and think about wonderful things." 'Let's Go' was released on 6th March 2015. It was produced by renowned country rock singer, songwriter and producer Buddy Miller. Regina told trade magazine Billboard, "When Buddy Miller agreed to produce the CD for the McCrary Sisters, we were overwhelmed with joy. Buddy is family to us. The first thing that Buddy did was give us 50 songs and asked us to pick 20, then from those, we narrowed it down to the 10 on the CD. The greatest blessing is that we get to sing about who and what we believe in - our God. And we get to give honor to our father, the late Rev Samuel H McCrary, who was the glue that kept the Fairfield Four together until he passed away." Alfreda added her thoughts about 'Let's Go'. "It is an honor to be able to sing the music that we were raised on - the old landmark music - with my sisters. This music is giving honor and thanks to some that made the way for us. They are singing our music from this new CD. I overheard my grandchildren singing songs on this CD - and they know the difference in today's music, and they absolutely love this vibe we've created." Better be glad the Rev. J.R. Carrethers, who founded the original Fairfield Four at Fairfield Baptist Church in the 1920s, isn't still around. He was very pointed about his leadership of the original crew. However, the Rev. Sam McCrary was a wonderful man indeed, and his version of the group, with Isaac Freeman, Willie Richardson, et al, still lives in memory as the best lineup.